The multiple districts of New Orleans, Louisiana, can complicate travel to the "Crescent City." Visiting Jackson Square, the French Quarter, Garden District and more essential hot spots require knowledge of New Orleans known only by the residents themselves. As a sightseeing traveler, I was not looking forward to navigating unfamiliar streets by rental car to reach the destinations on my list. From prior experience I knew that in any major city driving is disastrous, parking is expensive, and time is always of the essence, so for my trip to New Orleans I purchased a ticket on a New Orleans Hop On Hop Off Double Decker Bus Tour. 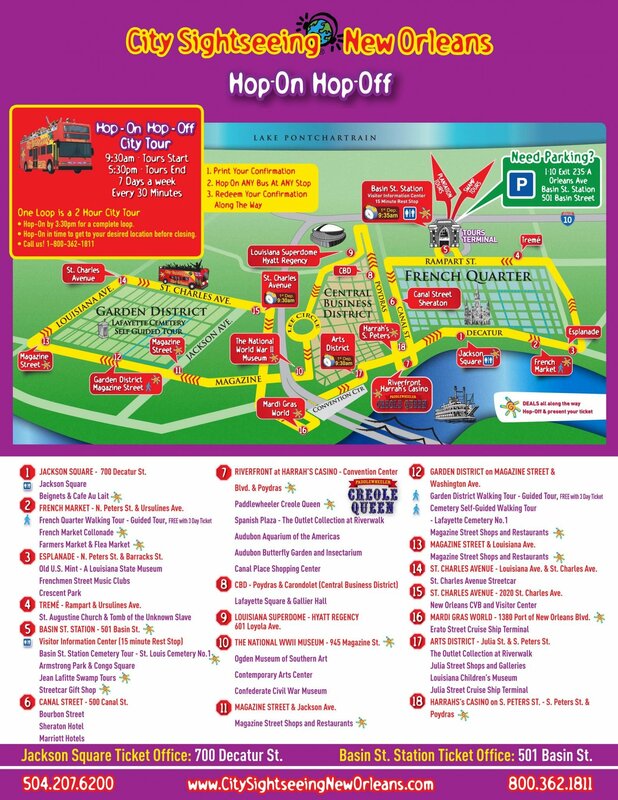 Discover dozens of French Quarter things to do during your Double-Decker Bus Tour online at FrenchQuarterAttractions.com! The Hop On Hop Off Bus Tour circles the city, stopping at major destinations (complete list below). Tickets can be printed, confirmed in email with a mobile device, or acquired from the main ticket office. Each ticket is valid for 3 days, and provides unlimited riding from the hours of 9:30am - 5:30pm. A bus hits every stop at intervals of 30 minutes, but also give riders the option to hang on the bus, and enjoy the sights, sounds, and expert guided narration (a full rotation through all 18 stops takes about 2 hours). Included with every ticket voucher is FREE walking tours, FREE self guided tours, and restaurant and attraction discounts. I decided to spend a whole day on the bus to get a good feel for how the bus tour functions. I first parked my car at the parking lot off 101 Basin Street, then made the short walk down to the Basin Street Station at 501 Basin Street. I boarded the bus and grabbed a seat on the top deck next to a delightful husband and wife couple. The husband, Johnny, told me it was him and his wife's second time visiting "Sin City," the first ending in frustration and confusion after fighting busy traffic in an attempt to navigate the city streets with no assistance. This time around his wife convinced him to purchase a pair of Hop On Hop Off Bus Tickets. He swears the bus had already saved him money on parking, and allowed him to see and learn more than he had on their entire previous vacation. With a little guidance from Johnny, I planned out my three destinations for the day. 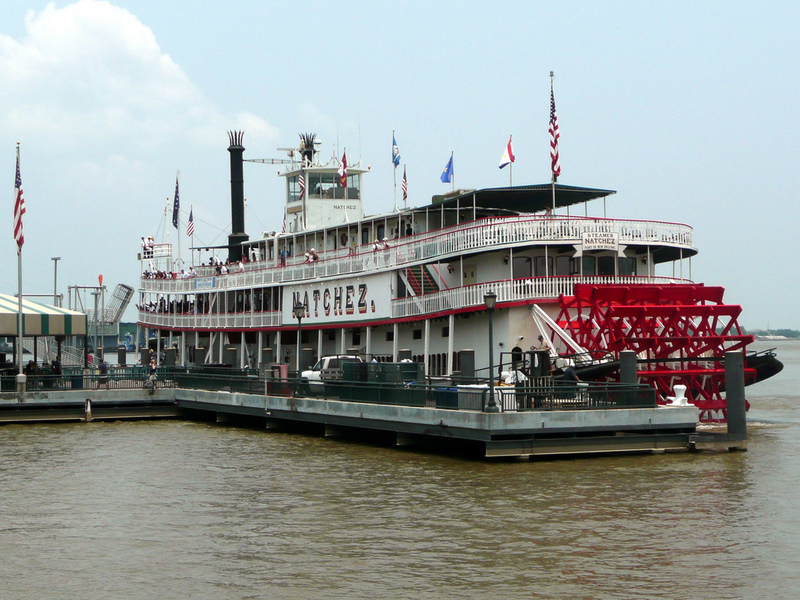 Gambling, Aquariums, lunch cruises on a real Steamboat?! The Mississippi riverfront offers something for everyone, and a true taste of New Orleans new and old. My first instinct was to try my luck at Harrah's Casino. This massive casino equipped with 104 card tables was hard to resist, so I stepped inside, and tried my hand at the slots. With a limit of $20, I managed to wrangle a $10 profit before moving on to one activity towards the top of my list, lunch on the Steamboat Natchez. Just a ten minute walk from Harrah's, I arrived at Toulouse Station just in time to board the 11:30am lunch cruise on a fully functional paddle steamboat. Authentic Jazz, expertly prepared creole dining, and unforgettable sights made this afternoon trip one of the highlights of my day. As a major history buff, I had to stop by the National World War II Museum. The massive museum contains hours worth of exhibits and films at the 4D Movie Theater. I thoroughly enjoyed the Beyond all Boundaries exhibit! The Museum made for an informative mid-afternoon trip, and I was able to grab a quick snack at the American Sector to fuel up for my next adventure. With the afternoon winding down, it was time to head to my final stop, the St. Louis Cemetery. The St. Louis Cemetery #1 is famous worldwide for stories of voodoo and ghost hauntings. The cemetery is open to the public, so it made for a fun, free cap to my day in the city. The self-guided tour included with my bus ticket helped me through the cemetery, taking me to popular spots like the tomb of Voodoo Queen Marie Laveau and Civil Rights leader Homer Plessy. As a fan of vampire folklore and ghost hunting, the areas of rumored supernatural activity were fun to see first hand.